I recently read an editorial by Harold W. Fairbanks in the 1905 edition of The Nature Study Review that contains a remarkably prescient summary of what has become a cause célèbre among today’s environmental educators. “Children … are shut away in too many instances from a free contact with nature; their needs are so provided for and dangers guarded against, that they grow up with undeveloped capacities and in almost total ignorance of the world of nature,” lamented Fairbanks. Recent generations of children have grown up with even fewer meaningful experiences in the outdoors than those of a century ago, and today’s youth spend far more time indoors or in highly controlled outdoor settings than ever before. In his 2005 book, Last Child in the Woods: Saving our Children from Nature-Deficit Disorder, journalist and child advocate Richard Louv introduced the term “nature-deficit disorder” to characterize the long-recognized suite of problems that could be attributed to childhood isolation from nature. Much like Fairbanks and the nature study practitioners of the late 19th and early 20th century, Louv believes that early experiences in nature profoundly influence a child’s physiological, emotional, and social development. According to Louv’s findings, children disconnected from the out of doors are very unlikely to be concerned about nature. Even worse, he notes, they grow into adults with little or no interest in conservation or environmental stewardship. It’s clear that if we are to cultivate knowledge about—and a sense of responsibility for—nature, we need to begin at a very young age. Those concerned about nature and environmental stewardship might benefit from considering old-fashioned, nature study as one way to offset nature-deficit disorder. The past, as exemplified by the nature study movement, may provide key insights for environmental education today. I can trace my fascination with nature all the way back to my pre-school years. By the time I was eight years old, that early interest prompted my decidedly non-outdoorsy mother to find ways for me to experience nature with more knowledgeable adults. While we were living in the Washington DC area in the 1950s she let me attend field trips with the Audubon Society of the District of Columbia. I didn’t know it at the time, but the kindly woman who took me under her wing on these outings would eventually become one of my personal inspirations and professional heroes. At first, she was simply Miss Carson to me, and she took time to interact with me in ways none of the other field trip attendees did. A connection that perhaps only birders would understand formed between us when I received as a Christmas present from my indulgent grandparents my first pair of serious birding binoculars: new, state-of-the-art Bausch and Lomb Zephyr 7x35s. Coincidently, Miss Carson also acquired the same binoculars. Although these binocs provided an icebreaker, it was clear to me, even before then, that she took special pleasure in sharing with me her sense of wonder with the natural world. I eventually figured out that my field trip buddy was scientist and nature writer Rachel Carson, then the award-winning author of The Sea Around Us. Published in 1951, The Sea Around Us captures the mystery and allure of the ocean with a compelling blend of literary imagination and scientific expertise. I had seen the Oscar-winning nature film adaptation of the book at my local movie theater, and was flattered that such a famous person as she would take an interest in encouraging a precocious young naturalist like me. I learned many things on those Audubon Society field trips to places like the Maryland shores and Pennsylvania’s Hawk Mountain. Most of the adult naturalists with whom I interacted in childhood seemed intent on teaching me facts, especially how to identify and name things. Miss Carson seemed more interested in exposing me to the pure joy of experiencing nature. Carson’s sensitive and effective approach stimulated my youthful curiosity and helped me to both love and understand nature. She encouraged me to observe, to listen, to explore and experience, to appreciate, and, most of all, to enjoy the wonders of the natural world. Years later I would discover that her interest in helping young people enjoy nature was a lifelong passion, and that she had attempted to create a how-to guide of sorts with a 1956 article titled, “Help Your Child to Wonder,” which was eventually made into a book called The Sense of Wonder shortly after her death in 1964. If I had influence with the good fairy who is supposed to preside over the christening of all children, I should ask that her gift to each child in the world be a sense of wonder so indestructible that it would last throughout life, as an unfailing antidote against the boredom and disenchantments of later years, the sterile preoccupation with things that are artificial, the alienation from the sources of our strength. For me, Carson was one adult who filled the role of “gift fairy.” And, although others would follow and influence me in different ways, her wonderful gift to me came at the perfect time when nature was still fresh and full of wonder and excitement. After my family moved to Cleveland, Ohio, my youthful interest in nature continued to flourish. I spent every moment I could outdoors (including, much to my mother’s dismay, frequent truancy when nature beckoned more than the classroom). My teenage enthusiasm for natural history caught the eye of several local naturalists who continued to mentor me, picking up where Rachel Carson had left off. One naturalist who took a special interest in me was Bill Scheele, director of the Cleveland Museum of Natural History. Scheele gave me a challenging job at the museum with the clear expectation that enriching experiences there would surely lead me toward a career in the natural sciences. He was right. My high school years at the museum provided unparalleled opportunities that allowed the passion for nature that Rachel Carson had cultivated to mature and become eventually more focused on conservation science. 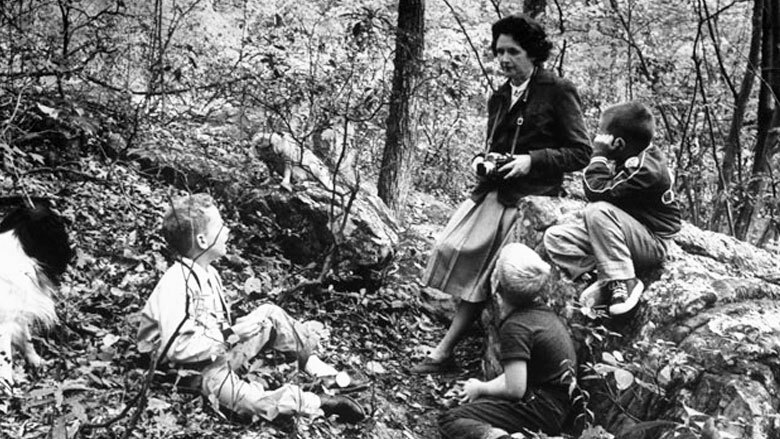 As the years went on and I embarked on my career as a scientist and educator, I began to wonder how Rachel Carson had formed her ideas about the importance of early exposure to nature. One can argue—and Carson herself suggests—that these ideas arose largely from her personal experiences rather than rigorous study of child development or comparisons of different methods of exposing children to nature. While children of her generation certainly had more opportunities to spend free time in nature, an influential force at the time was the popular nature study movement championed by Cornell University illustrator and educator Anna Botsford Comstock. In fact, Comstock literally wrote the book on the subject, and her Handbook of Nature Study, published in 1911, lasted for twenty-five editions in eight languages and touched tens—if not hundreds—of thousands of young lives across the world. Nature study proponents like Comstock, Liberty Hyde Bailey, and Louis Agassiz believed early positive experiences in nature would lead to affection for nature, impart a basic understanding of how the world works, and encourage a sense of environmental stewardship. From 1896 to 1904 Cornell University issued a series of “Nature-Study Leaflets” that were widely distributed to schoolteachers and students to guide their outdoor learning activities. The movement and those leaflets influenced many naturalists and scientists who grew up during this period, including Rachel Carson and Aldo Leopold. In fact, the American Nature Study Society, founded in 1908 by Comstock and Bailey, is one of America’s oldest environmental organizations still in operation today. Rachel Carson’s mother, Maria, a former schoolteacher with an interest in natural history, would have been familiar with Comstock’s Handbook of Nature Study. She introduced her young daughter to nature using methods promoted by the movement. One such exercise that Rachel Carson experienced as a child and that she shared with me was collecting caterpillars and cocoons of moths and butterflies and carefully observing them metamorphose. To this day, I can recall my childhood awe at first watching a beautiful cecropia moth emerge from a cocoon I had collected on a field trip the previous fall. Clearly, Rachel Carson would later incorporate nature study approaches such as this into her own ideas about children’s education and, in many ways, make them central tenets of her work. One wonders what Rachel Carson, were she alive today, would think about the approaches we have been pursuing. After the publication of her 1962 book, Silent Spring, Rachel Carson was often in the news, and she was a frequent topic of lively discussions in which I took part at the Cleveland Museum. For many Americans, Silent Spring was an eye-opening account of the detrimental effects on the environment—particularly on birds—of the indiscriminate use of pesticides. But the book was also an indictment of an unregulated chemical industry and the public officials who unquestioningly accepted industry claims of safety. I read Silent Spring and followed the public debate over DDT with special interest, since I knew Carson and by that time had become especially interested in birds of prey, a group of species that was being decimated by pesticides. Then, in early 1964, I received an unexpected opportunity to reconnect with the woman who had nurtured my early interest in nature. A family friend asked if I would like to see Carson, who was secretly in the city for medical treatment at his oncology clinic. Of course, I did, and he arranged for a brief visit. Although she was obviously very ill (I later learned she was dying of cancer), she was as wonderful as I remembered her. She seemed pleased that my early childhood fascination with nature—which she had cultivated—had blossomed and that I was going to study ecology and ornithology at Cornell University. Carson died later that spring at her home in Silver Spring, Maryland, the manuscript for her book on children and nature left unfinished. If facts are the seeds that later produce knowledge and wisdom, then the emotions and the impressions of the senses are the fertile soil in which the seeds must grow. The years of early childhood are the time to prepare the soil. Once the emotions have been aroused—a sense of the beautiful, the excitement of the new and the unknown, a feeling of sympathy, pity, admiration or love—then we wish for knowledge about the subject of our emotional response. Once found, it has lasting meaning. For me, Rachel Carson personally prepared the soil from which my career and lifelong love of nature would spring.